Motion sickness is a condition experienced by patient caused due to difference between the visually perceived motion and vestibular system’s senses of movement. Motion sickness is characterized by a set of symptoms such as nausea, fatigue, and dizziness. The global motion sickness treatment market was valued at approximately US$ 670.0 Mn in 2017 and is anticipated to expand at a CAGR of more than 3.0% from 2018 to 2026 to reach approximately US$ 900.0 Mn by 2026. Adoption of prescription motion sickness drugs is high in developed countries. 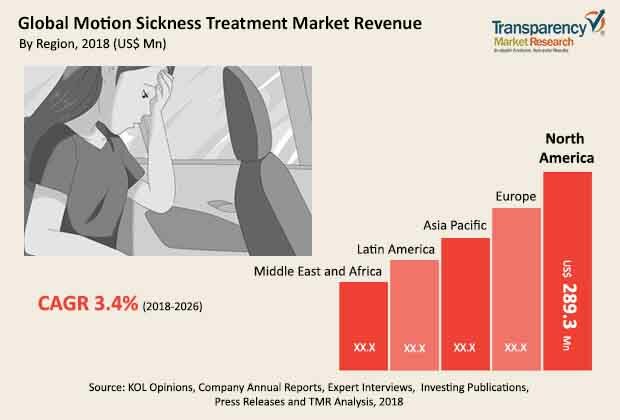 Rise in adoption of these drugs in emerging countries due to the increase in number of travelers is likely to drive the global motion sickness treatment market. Motion sickness is a common condition experienced by around 50% to 60% of the general global population. It is more common in children and elderly. Various prescription and over the counter (OTC) drugs and products are available for treat motion sickness. Adoption of prescription drugs such as scopolamine patches and tablets and promethazine tablets is increasing in developed markets as these provide long lasting relief, better efficacy, and fewer side effects. Higher prices of these products are likely to drive the motion sickness treatment market. Surge in number of travelers across the globe is estimated to increase consumption of motion sickness remedies. According to the United Nations World Tourism Organization (UNWTO) in 2017, international tourist arrival grew by 7% as compared to 2016. Studies estimate that around 50% of travelers experience motion sickness in course of travel. However, recent introduction of generic transdermal scopolamine patches and over dependence on OTC and traditional medicines for motion sickness treatment are likely to hamper the global market. There are several OTC products to treat motion sickness; however, there are limited options for children or pediatric specific drugs. Transdermal scopolamine patches are indicated for use only in adults. In May 2012, Dramamine, an OTC product was introduced for children indicated in reduced drug dose. However, there is an unmet need for children specific motion sickness treatment products. New drug formulations are being developed which can be administered through alternative routes such as intranasal scopolamine spray. GT Biopharma, Inc. is developing a transdermal patch containing muscarinic receptor antagonist as a key ingredient. Industry players are also focusing on prescription to OTC switch of the motion sickness treatment remedies to expand their market reach and increase accessibility to patients. People with motion sickness often self-medication with vastly available OTC and traditional medicines. The global motion sickness treatment market has been segmented based on treatment type, route of administration, distribution channel, and region. In terms of treatment type, the anticholinergic segment is projected to dominate the market and is expected to continue this trend during the forecast period, followed by antihistamines. Anticholinergics such as transdermal scopolamine patches are available as prescription drugs. Antihistamines such a dimenhydrinate, promethazine, and cyclizine are available as prescription and OTC drugs which has contributed for their significant market share. Based on route of administration, the transdermal drugs segment is projected to account for a dominant share of the market in terms of value during the forecast period, followed by oral drugs. In terms of distribution channel, retail pharmacies was a leading revenue generating segment in 2017 and is likely to continue its dominance during the forecast period. The others distribution channel segment is likely to account for significant share of the global market due to high reliance on OTC and traditional medicines and their vast availability across drug stores and hospital pharmacies. Based on regions, North America accounted for a considerable share of the global motion sickness treatment market in 2017. North America accounts for a dominant share the global market due to high adoption of expensive prescription drugs for the treatment of motion sickness in the U.S. The market in Asia Pacific is projected to gain share during the forecast period and is likely to be a key revenue generator during the forecast period. Increase in number of travelers and rise in initiatives by international pharmaceutical companies to garner market share in the region are likely to fuel the market in Asia Pacific. Key companies operating in the global motion sickness treatment market and profiled in the report include GlaxoSmithKline Plc., Perrigo Company plc, Prestige Brands, Inc., WellSpring Pharmaceutical Corporation, Caleb Pharmaceuticals, Inc., Myungmoon Pharm CO., LTD., Baxter International Inc. and Reliefband Technologies LLC. These players adopt organic and in-organic growth strategies to expand their product offerings, strengthen their geographical reach, increase customer base, and garner market share. For instance, Prestige Brands, Inc. emphasizes on brand extension by introducing new product variants and Perrigo entered into an agreement to acquire Geiss, Destin & Dunn, Inc., a health care and consumer goods distributor to strengthen its market presence in the U.S. The global motion sickness treatment market report comprises an elaborate executive summary, which includes a market snapshot that provides information about various segments. It also provides information and data analysis of the global market with respect to the segments based on treatment type, route of administration, distribution channel, and region. A detailed qualitative analysis of drivers and restraints of the market has been provided in the overview section. The report provides key insights of the global motion sickness treatment market comprising global pipeline analysis, key mergers and acquisitions, OTC vs. prescription drug market assessment, and Porter’s Five Forces Analysis. Additionally, the competition landscape section comprises competitive matrix, key player’s market footprint by treatment type and region, key competitive business strategies, and company profiles with business overview to understand the competitive landscape in the market. The report also provides market attractiveness analysis by region, thereby presenting a thorough analysis of the overall competitive scenario in the global motion sickness treatment market. Based on treatment type, the global motion sickness treatment market has been segmented into anticholinergic, antihistamines, and others. The report also offers overview of the global motion sickness treatment market based on oral, transdermal, and other routes of administration. The treatment type segments have been analyzed based on commercially available motion sickness treatment drug and product types, route of administration, and adoption of each treatment type. The market size and forecast for each of these segments have been provided for the period from 2016 to 2026, along with their respective CAGRs for the forecast period from 2018 to 2026, considering 2017 as the base year. In terms of distribution channel, the global motion sickness treatment market has been segmented into retail pharmacies, online pharmacies, and others. The market size and forecast for each of these segments have been provided for the period from 2016 to 2026, along with their respective CAGRs for the forecast period from 2018 to 2026, considering 2017 as the base year. Geographically, the global motion sickness treatment market has been segmented into five major regions and the key countries/sub-regions in the respective region: North America (the U.S. and Canada), Europe (the U.K., Germany, France, Italy, Spain, and Rest of Europe), Asia Pacific (China, Japan, India, Australia & New Zealand, and Rest of Asia Pacific), Latin America (Brazil, Mexico, and Rest of Latin America) and Middle East & Africa (GCC Countries, South Africa, and Rest of Middle East & Africa). The market size and forecast for each of these regions and the mentioned countries/sub-regions have been provided for the period from 2016 to 2026, along with their respective CAGRs for the forecast period from 2018 to 2026, considering 2017 as the base year. The research study also covers the competitive scenario in these regions. The report also profiles major players in the market and provides various attributes such as company overview, financial overview, product portfolio, business strategies, and recent developments. Major companies profiled in the motion sickness treatment market are GlaxoSmithKline plc, Perrigo Company plc, Prestige Brands, Inc., WellSpring Pharmaceutical Corporation, Caleb Pharmaceuticals, Inc., Myungmoon Pharm Co., Ltd., Baxter International, Inc. and Reliefband Technologies LLC.